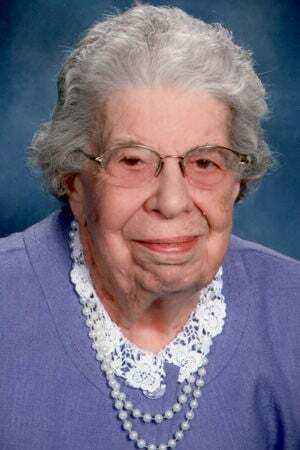 BLOOMINGTON — Marian Elizabeth Youngblood, 97, of Bloomington, passed away Sunday (March 3, 2019) at her home where she had lived for 65 years. She was born Nov. 13, 1921, in Fairbury, to Walter D. and Mona M. Meeker Henning. She married Delbert E. Youngblood Sept. 12, 1948. He preceded her in death. She is survived by two sons, Paul Youngblood, Normal; David Youngblood, Bloomington; two daughters, Linda Oliveira, Urbana; Carol Brown, Bloomington; two granddaughters, Jennifer (Mike) Burris, Knoxville, Tenn.; Ashley Oliveira, Urbana; two great-grandsons, Dylan Burris, White Pine, Tenn.; Joey Dengmanivanh, Urbana; one great-granddaughter Sydnee Burris (Seth Metts), Knoxville, Tenn.; and one sister Dorothy Scott, Estes Park, Colo.
She was preceded in death by her parents and three brothers, Hugh Henning, Donald Henning and Everett Henning. Marian went into the United States Navy after high school. After her time in the Navy she worked for The Baby Fold and State Farm. She later became a stay-at-home mom and helped Delbert with his accounting business. During that time she fearlessly fought breast cancer. She also became very involved in many different organizations, the American Legion Auxiliary, Amvets Auxiliary, 8 and 40 Auxiliary. She was a Girl Scout leader, Cub Scout leader, and helped with disabled Boy Scouts. She had been a member of Wesley United Methodist Church for more than 70 years. Marian enjoyed her flowers, especially her violets. She enjoyed traveling, puzzles, games and latch hook. Visitation will be from 5 to 7 p.m. Monday at East Lawn Funeral Home, Bloomington. Funeral will be at 11 a.m. Tuesday with a one hour visitation prior to the service at Wesley United Methodist Church, Bloomington. Burial will follow at Evergreen Memorial Cemetery, Bloomington. Military honors will be given by the Bloomington-Normal American Legion Honor Guard. Memorial contributions may be made to Wesley United Methodist Church. The family would like to thank Advocate Adult Day Care, Show Bus, Community Care Systems, OSF doctors and Hospice, and neighbor Shirley Danner for all their love and care.